Good Morning Everyone! I'm sitting by my fireplace this morning with a nice cup of hot chocolate to start my day! I love starting my days by the fireplace in the morning when the weather get's chilly, and boy did it get chilly FAST! I'm not a cold weather fan, so starting my day with a treat is always a good motivation to get up and going! Should we find out what's new at Creekside this week? First we have Matilda! I love this festive doll pattern, Matilda by Cottonwood Creations. 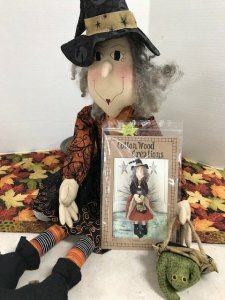 It's just in time for Halloween, and chances are good, most of us would have enough scraps from our Halloween quilts, to use in order to make this festive doll! Some of you may be able to get her done before Halloween this year...others? Well, it could be a work in progress for next year! Next, we received in Moda's Nature's Glory by Kansas Troubles! 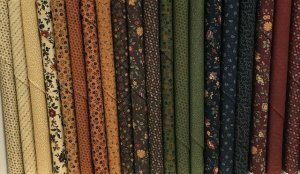 Great line of fabrics for the Reproduction lovers! 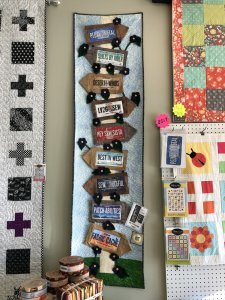 Janice made this quilt and it's great for all of us who have store license plates and wondering what to do with them! Janice said this quilt was fun to make, and she used wool and buttons for the flowers! The pattern calls for 9 license plates, but who is to say you couldn't make the quilt longer! 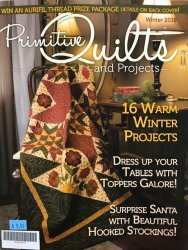 Primitive Quilts Winter 2018 came in yesterday afternoon! This month, we have two people showcasing their quilts in the classroom! Gayle Breneman is showcasing her embroidered quilts in our classroom! The embroidery is all hand done, and they are gorgeous! 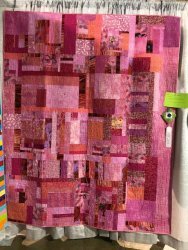 We also have Cheryl Meester showcasing her festive fall quilt, and I love it! Thank you to both ladies for sharing their talents with us! Thursday, October 18th: Pat is teaching Binding Basics from 6-8:30 pm. Learn to prepare binding strips, attach them to your quilt edge, and turn mitered corners. 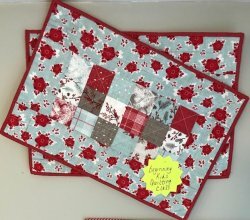 We will also discuss a 2 color binding technique that can give your quilt binding a pop of color. Every quilter needs this class to give their quilts a nice finish. This will be the last binding class for 2018 and there are 3 spots left! We have 6 spots left for this event! We have 4 spots left for this event! Stephanie Brandenburg will do a lecture, trunk show, and meet and great from 3:30-6 pm! No need to sign-up, just show up and enjoy! Friday, October 26th: UFO Day! Come join us! We still have room for more! NEW! 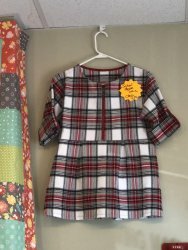 December 2nd is a Beginning Garment Making: Shoolhouse Tunic and Techniques Class from 1-4:30. The Schoolhouse Tunic is a comfortable, empire waist top with pleats that can be made in your choice of shirt or tunic length. The pattern is a blank slate for creative embellishments such as zippers, eyelets and sleeve tabs. Class Policy: All class fees go straight to the instructor. Due to the time each teacher puts into preparing for a class, no refunds will be made for canceling a class within one week of the class date. In the same respect, should we need to cancel a class due to not meeting the minimum amount of students, we will cancel the class one week prior class date and offer a full refund or a class credit toward another class. NEW!! 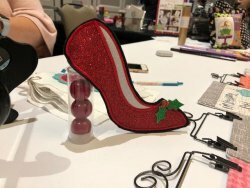 Sleigh Bells BOM: You can now pay for the full year of the kit, at a discounted price verses paying monthly for the kits. If you chose to pay monthly at $10 a kit you will end up paying $110 plus tax over the year, if you pay for the year of kit's upfront before December 31st, you will only pay $99 plus tax. The kits will still come monthly, as you will not receive all the kits starting in January. For mail orders, shipping fee will be added each month. NEW! Simple Whatnots BOM: You can now pay for the full 8 kits upfront at a discounted price verses paying monthly for the kits. If you chose to pay monthly at $37.98 a kit you will end up paying $303.84 plus tax over the year, if you pay for the year of kit's upfront before December 31st, you will only pay $287.84 plus tax. The kits will still come monthly, as you will not receive all the kits starting in January. Try our new Blue Sky yarns by taking 20% of retail price. The yarn at Creekside is 100% organic and it is so soft! It would make a great hat or scarf to prepare for this upcoming winter weather! Hope you were able to start your morning with a treat while reading this newsletter! With the weather turning chilly fast, it's probably time to talk SNOW! Here is Creekside's SNOW Policy: should the Des Moines School District cancel classes for the day, we will close UNTIL the streets are safe for travel. If a blizzard is coming in during store hours, we may make an executive decision to close early in order to get our staff home safely. I will try to post all closings on the internet home page, but if you are not sure, please just give the store a call. Happy Sewing!